Since 2006 there have been five new ballparks built, starting with Nationals Park in DC and most recently, Marlins Park in Miami. While we only enjoyed one season of being able to say we've been to all 30 current parks, it's nice to see some of the lower level yards get updated. Plus, now we've got vacation plans to make to see the new parks. Below you'll find writeups on some of the ones we've visited. Of the three new ballparks still remaining on my list to see, the toughest one to get to by far was Target Field in Minneapolis. My Aunt who we stayed with on the road trip had moved a couple years back and the one friend that I have there got married while the Metrodome was still in use. My last home was the one and only @LakersReporter, Mike Trudell. The last Minnesotan in my life came through with a wedding that coincided with a Twins homestand. We had to fly in a day early, but that was easy enough, and well worth it to catch a day game in downtown. The Metrodome served the Twins from 1982 to 2009, but it also ranked lowest in our ratings among the 30 parks we visited. While just about anything would be an improvement, Target Field is a big improvement. The concourses are wide and have touches of Twins history and the naming sponsor Target. Local flavors are celebrated in food (Walleye that will melt your face!) and craft beers (Fulton Sweet Child of Vine was my favorite) all over the ballpark. Great seating area and plenty of ample covered space to stay cool on a hot day like this. I especially liked the standing area behind the bullpens in centerfield. The Twins lost 3-1, but bonus points because I got to wear my Kirby Puckett beard shirt in an appropriate setting for the first time. Love little Puck. With my sister joining me on the East Coast swing this year we hopped a train down to DC before making our way to the Cape. During the road trip Dan and I spent the All-Star break in the Nation's Capital with our cousin Lee, who lives 30 minutes south in Sprinfield, VA. It was a quick turnaround but we made the most of the day, seeing the sites before heading down to the Navy Yard part of town where the new Nationals ballpark is located. Nationals Park is new and great, but somewhat indistinguishable from the other new yards out there. The upper deck affords you a unique view of the Capital building and DC sites, but nothing else about the park stands out. Game was close before the Giants plated 4 in the 7th to take control. Having friends that live in New York is something everyone should strive for. Otherwise it's just too cost prohibitive to visit there. For the second straight summer I made the East Coast Swing to see my boy Dikkie (who we hung out with after the Red Sox game on the trip) for some time in the city before a weekend in Cape Cod. After a long night up I dragged myself off the couch and caught the 4 train up to the Bronx. All the games are sold out being the stadium's inaugural year, but I was able to score a single from one of the shady scalpers just off the subway platform. New Yankee Stadium is amazing. You can't deny that. But it almost feels like a little too much. Too sanitary. Too opulent. But the one thing it isn't is too Yankees. This fits right into their wheelhouse. Really nice historical items dot the inside and outside of stadium. Overall it's just a beautiful setting. I visited my upper deck seat for an inning before meandering around the concourse and stopping off at the various standing room only areas. 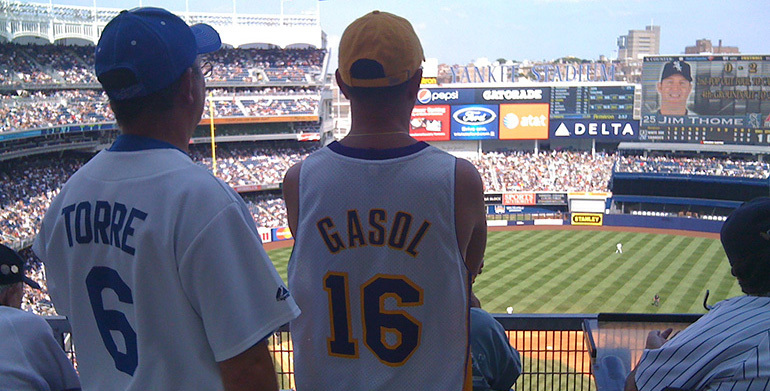 I even ran into some Lakers season ticket holders who are New York natives but have lived in LA the past 35 years. As great as the old stadium was, this was necessary. 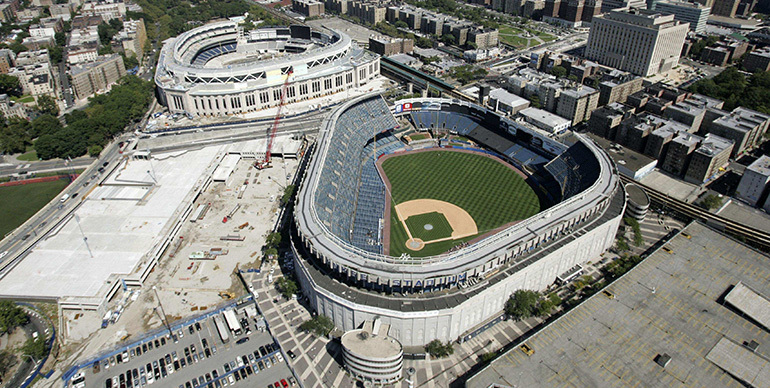 The Yankees needed a modern ballpark with multiple revenue streams to fuel their high-spending ways for the next 30 years and, fortunately, they came out with a beautiful yard that fits the bill. And the home team won, so everyone was in good spirits.